Ergonomic Mouse Pads Reviews- Shopping for an Ergonomic Mousepad? Read ergonomic mouse pads review and recommendation. Check out which is the best ergonomic mousepad. Learn also some mousing ergonomics and how to choose the right mouse pad. Shopping for ergonomic mouse pads? Click to go directly to our recommendations. A lot of people use computers in doing their work everyday. They spend most of their time in front of the computer which has resulted to several injuries brought about by too much strain and discomfort while using it. People have acquired these injuries due to stretching of the tendons and compression of the muscles. Do you do this? Don't! Do you use an 'ergonomic' mousepad with an added wrist rest? Click to read why you should take caution. Ergonomic peripherals have been manufactured to conform to ergonomic theories to alleviate a person's condition while doing work on a computer, and the mouse pads are among them. If you are thinking of buying an ergonomic mouse pad, you have to remember to look for one that allows your hand to be positioned naturally. Try to test it while standing and see that the hand stays at a natural angle. Always remember to check if the mouse has a stable rest for the wrist. It must be attached to the mouse pads. If they are not attached, make sure that they adhere well to the table and don't slip. The wrist rest should be made of soft material as this helps lessen the pressure on the tendons and nerves on the wrists including the forearm. If they are made of hard materials, then they forfeit the purpose of giving comfort as wrist rests like these just make the compression worsen resulting to discomfort and pain. When looking for a good wrist rest, try to find one that is positioned correctly so that it is the palm of the hand that stays on the pad instead of the wrists. The hand should be allowed to move freely and if there is a bit of discomfort, you should be able to adjust it. You should make sure that the wrist rest has the right size. It should have a minimum depth of 1.5 inches when it is measured from the front to the back. However, we have the temptation of resting our wrists when mousing. Don't! See our recommended Ergonomic Mouse Pads below. Useful ergonomic mouse pads can be bought at your local computer stores or bought conveniently online. The WaveRest Gel Mouse Pad from Belkin lets you input data more comfortably and provides a smooth tracking surface for your mouse. Our specially designed ergo support pad is perfect when youre typing for long periods or surfing the Internet. The patented GelFlex Comfort Zone conforms to your hands curves and helps reduce wrist stress that could lead to repetitive motion disorders. Soft foam pillow responds to your body's weight and warmth, yet never loses its shape. It conforms to your wrist for exceptional comfort while redistributing pressure points for soothing support and retaining body heat for improved circulation. It also ensures proper hand position while typing and mousing. Optical-friendly mouse pad for superior tracking control. Non-skid backing holds pad firmly in place. Try visiting Nextag to find this gel mouse that provides ergonomic support for the wrist due to the wave design. It fits perfectly at every angle of your hand and supports each movement. The tracking surface of the pad gives easy and accurate mouse tracking. Resting your wrists regularly when you take typing breaks prevents the risk of carpal tunnel. For another good ergonomic mouse pad, you can look at . This mouse pad is priced at $16.99 from the regular price of $25.99. You will never regret buying this product as it allows the user comfort at all times. It is made of foam that is of high quality and has a slot that is contoured for the hand to fit into. Soreness of the palms and wrists will be minimized while using the product. It is one good thing to own. Whenever you are using the keyboard, make sure that the wrists do not sit on anything. The wrist rest is to be used only when the hands are at rest and not when typing. It is not advisable to lay the wrist on a mouse pad while one is typing because it increases the pressure on the middle nerves. Whenever the edge of a table hits the wrist, then the problem is due to the height of the table. The wrist pad must be used only as a last resort as it is just there for the purpose of supporting your wrist from accidentally hitting the sharp edge of the table. It should be used for a short time only and must not be used during long periods. 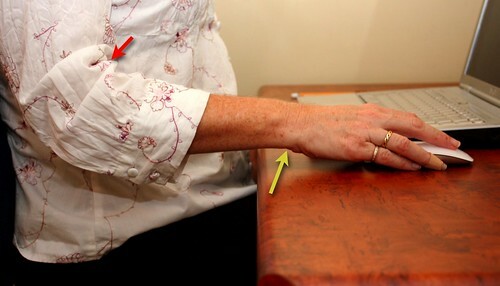 So in order to avoid having wrist and hand problems in the future it is good to look at several ways to get comfortable while working at a computer. It is best to remember never to rest the wrists while typing and using the mouse. Do not buy a product with a puffy wrist pad as it just raises the surface higher. Using a wrist guard or computer glove is one alternative that you can take. Go back to The Case of the Mouse Pad with Wrist Rest. Thank you for reading 'Ergonomic MousePads Reviews'!